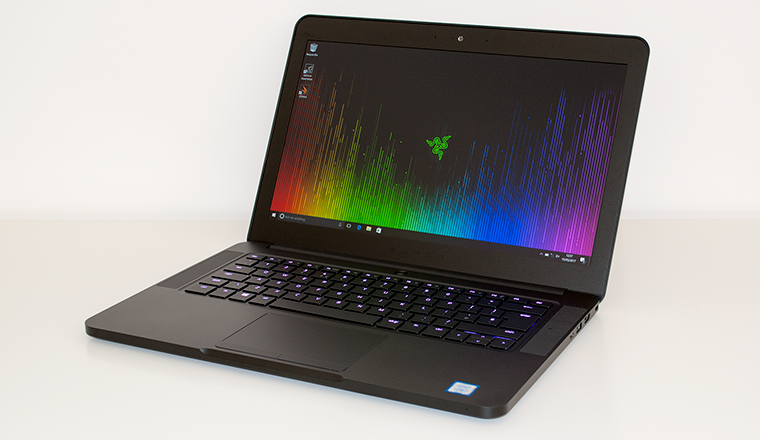 The Blade gaming laptop has become a firm favourite among Razer's legion of fans since its inception way back in May 2013, and it's clear to see why. 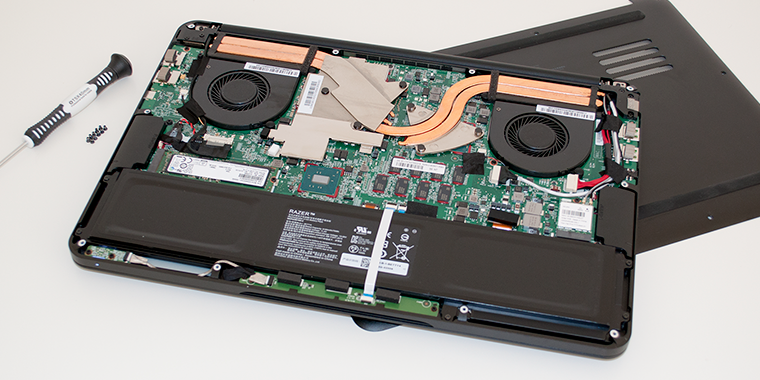 Whereas rival solutions tend to favour garish designs that lack a certain level of attention to detail, the 14in Blade has the rare ability to look and feel like an Ultrabook while delivering the performance of a gaming machine. And it's testament to the sleek chassis design that, four years later, it still comes across as a modern and stylish piece of kit. Measuring a hair under 18mm thick and employing aluminium construction throughout, the frame is both svelte and strong and continues to position the Blade as one of the best-looking gaming laptops around. Finished almost entirely in black and garnished with a few elements of bright-green trim, it can be viewed as a MacBook on acid. Razer's design is a known quantity (and yes, it's still highly susceptible to fingerprints), but what makes the Blade particularly interesting is the way in which it has evolved over the years. Back in 2013 the launch model came equipped with a sub-HD display, a fourth-generation Intel processor, 8GB of memory and a 2GB Nvidia GeForce GTX 765M GPU. Fast forward to 2017 and the latest refresh, priced at £1,800, ups the ante with a full-HD screen, a seventh-generation Intel Core i7-7700HQ processor, 16GB of DDR4 memory and an Nvidia GeForce GTX 1060 GPU with 6GB of onboard memory. Not bad for a portable system measuring 345mm wide and weighing less than 2kg (1.86kg, to be precise). The upgrades are all welcome additions and this time around there is a choice of display options. The entry-level spec includes a matte 14in IPS panel with a full-HD (1,920x1,080) resolution, but if you're willing to stretch the budget to £2,300, you can bag a 14in UHD (3,840x2,160) display with touchscreen capabilities. The former favours gaming at the native resolution and bodes well for battery life, but the latter will deliver greater clarity and is ideally suited to productivity. It's a shame Razer hasn't used this opportunity to shrink the large display bezel as this is one of few areas where the chassis is beginning to show its age. Elsewhere, it's the Blade we know and have come to appreciate. Stereo speakers positioned either side of the keyboard do a good job of belting out audio, albeit with little in the way of bass, and both the keyboard and trackpad are better-than-average for a compact gaming laptop. The keys still offer minimal travel and feel flat under the finger, yet the layout serves up no unwanted surprises and the RGB backlight is implemented particularly well. Each key is consistently lit and via the Synapse utility it's easy to customise effects, create macros and synchronise profiles you happen to have saved from other Razer products. 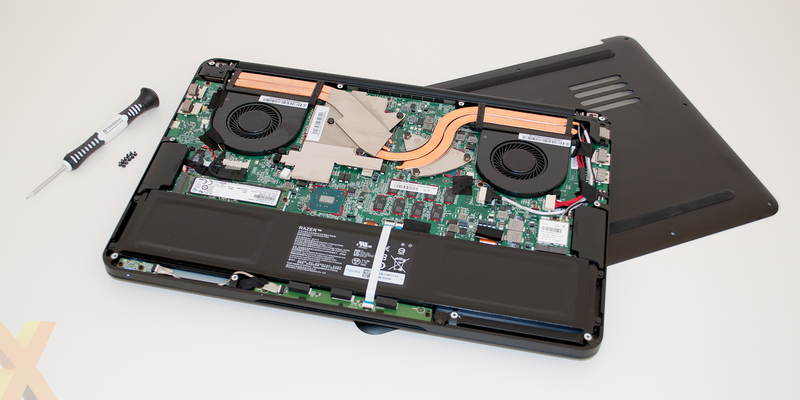 The Synaptics trackpad also works well, with a large, responsive surface and two dedicated buttons. Connectivity is mostly well thought out. 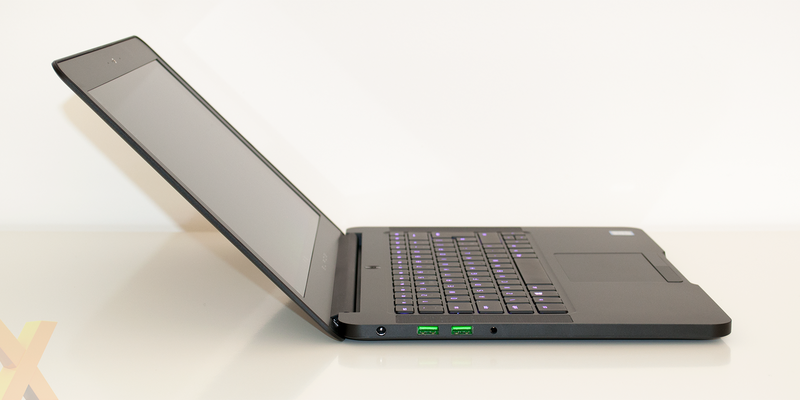 Blade's left edge houses a headphone jack, dual USB 3.0 ports (coloured in Razer green, of course) and a connector for the power supply. Over on the right there's HDMI output, another USB 3.0 and Thunderbolt 3. The latter provides compatibility with Razer Core external graphics, as well as any USB-C peripheral, and as you'd expect there's built-in Wireless AC (Killer 1535) and Bluetooth connectivity as standard. 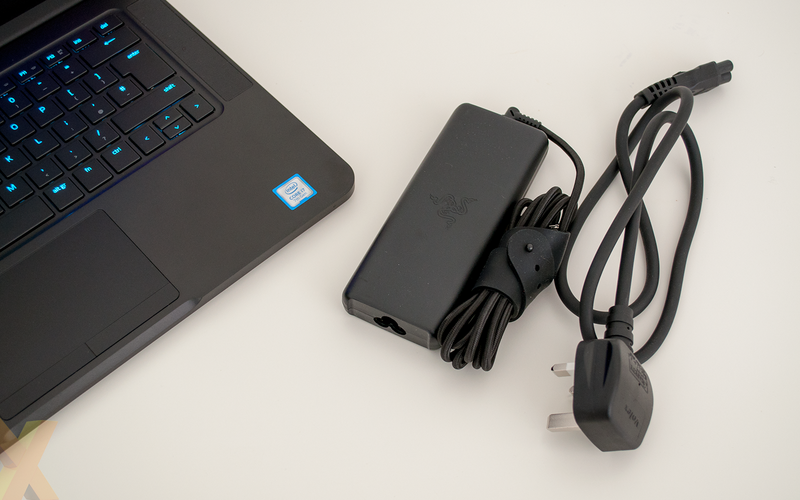 What's missing is an Ethernet jack and an SD card reader, and if you rely on a wired connection note that Razer doesn't include a USB-to-Ethernet dongle as part of the bundle. The hardware upgrades are evolutionary and both the CPU and GPU continue to be cooled by a combination of four heatpipes and dual exhaust fans. Noise, which we'll cover later in the review, remains a sticking point, and with only one M.2 slot, storage capacity can also be a concern. 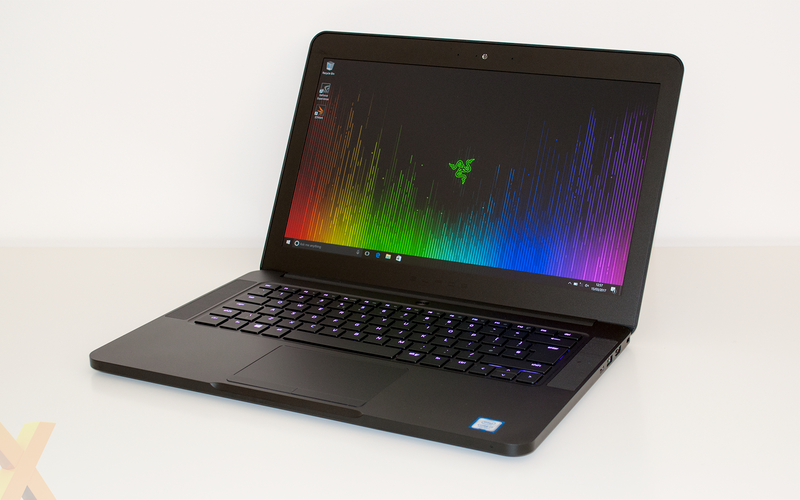 Razer's most basic £1,800 specification includes only a 256GB SSD - upgrading to 512GB increases cost to £2,000 and a 1TB model pushes the price up to a staggering £2,400. If you are going to be installing multiple games, the larger drives should be viewed as a necessity rather than an option. Given the premium, Razer needs to give Blade an aura of superiority and it gets some way toward achieving that goal through subtle touches that help elevate the overall experience. The display hinge, for example, has just the right rigidity not to wobble and yet can be opened easily with one finger. There's no bloatware in sight, the bundled power supply is a cute little unit rather than a typical brick, and if you're a fan of the Razer green you'll enjoy the Matrix-like appearance of the Windows command prompt. It's a seductive piece of kit, so let's see what this latest specification can really do.